President Donald Trump is warning Russia to get ready for a US missile strike on Syria – and it could be coming soon. Saturday’s suspected chemical attack in the Syrian city of Douma has reportedly killed up to 40 people and put new focus on the already seven year-long Syrian Civil War. The conflict has reportedly claimed the lives of as many as half a million people, caused the worst refugee crisis since WWII, and destroyed so many cities and so much infrastructure that the cost to rebuild is an estimated $US200 billion. What started as street protests turned into a civil war, and has now erupted into a war that involves dozens of nations (directly or indirectly), hundreds of armed groups, and four main sides. Despite all that, the war continues – and shows no real signs of stopping anytime soon. In the spring of 2011, a series of pro-democracy protests known as the Arab Spring were rocking countries across the Middle East. In Syria, people peacefully protested in the streets after President Bashar Assad’s government arrested and tortured teenagers for writing pro-revolution graffiti on their school wall. To quell the protests, government forces started opening fire during marches and sit-ins. With hundreds of people now killed by Assad’s government, the protesters who initially called for more civil liberties started demanding a total overthrow of Assad’s regime. With no end to the violence, some former government officers formed the Free Syrian Army to support the opposition. Other armed groups with various ideologies and loyalties would also be created. As sides battled for control over major cities such as Homs and Aleppo, the fighting escalated into a full-blown civil war by the end of 2011. By 2012, fighting between rebel groups and government forces had spilled into the streets, killing and displacing thousands. As the war continued, Assad’s government is believed to have started using highly toxic chemical weapons to strike densely populated areas. More than 1,000 people died in a 2013 sarin gas attack on the Damascus suburb of Ghouta, which crossed former President Barack Obama’s now-infamous “red line” and led to a deal brokered with Russia to destroy Assad’s declared chemical weapons stockpile. Assad’s government started using heavy artillery and barrel bombs — barrels filled with explosives and materials like shrapnel and nails and then dropped from helicopters — to quell the opposition, which led to even more deaths in both rural and urban regions. 2016 took a great toll on Syria’s children, many of whom have been killed, separated from their families or stranded in refugee camps. By 2017, over 450,000 Syrians had been killed in the war. “The level of human suffering that I am witnessing with the Syria crisis is indeed without a parallel,” said UN High Commissioner Antonio Guterres. Years of fighting also fuelled the rise of Islamic extremists like ISIS and al-Qaeda affiliate Jabhat al-Nusra, who capitalised on the turmoil by taking over large sections of Syria and Iraq. As Bashar al-Assad lost ground to rebels and terrorist groups, Lebanon’s Hezbollah militant group entered the war on the side of Assad. Thousands of Hezbollah militants came across the border and fought ISIS and rebels. Israel, worried that Iran would give Hezbollah advanced weapons, conducted numerous strikes on the group, and other Iranian targets in Syria. Though Israel never confirms or denies its role, there are fears as to how Hezbollah, Iran, and Syria will respond when the war is over. As fighting continued to devastate the Middle Eastern nation, the conflict escalated into a proxy war between the US, Russia, and Iran. 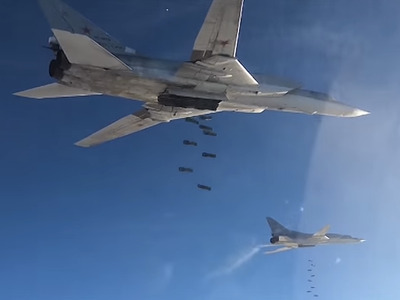 While the US decried Assad’s government and supported “moderate” rebel groups fighting the regime, Russian airstrikes and Iran-backed militias bolstered Assad’s army. Both Assad’s government and rebel groups were responsible for grave human rights abuses, a UN report found. With Russia supplying weapons to Assad’s government, the fighting for major cities like Palmyra and Aleppo continued into 2017. Six years of unabated bombing and fighting caused irreparable damage to Syrian infrastructure and society. On April 7, 2017, Assad’s government is believed to have carried out another chemical strike on a town in Idlib province. At least 70 people, including 10 children, died in the attack. US President Donald Trump launched cruise missiles at the airfield where Assad’s warplanes are believed to have taken off loaded with chemical weapons. It was the first US attack on the Syrian government since the war erupted in 2011. As Western countries fight over political influence, the Syrian War continues to ravage, kill and displace Syrian families. Nearly five million people fled the country as refugees and over 400,000 are waiting inside refugee camps. As ISIS becomes less of a threat in the region, groups that have had an unofficial truces have had numerous skirmishes, or have openly started fighting each other. In January 2018, Turkey launched “Operation Olive Branch,” a military intervention into Syria’s Kurdish-controlled Afrin Region to to replace Kurdish authority with a different faction. On February 7, 2018, up to 200 “pro-regime forces,” reportedly Russian mercenaries, were killed in US airstrikes after they attacked US-backed Kurdish forces and their American advisors across the Euphrates River. On February 10, 2018, Israel shot down an Iranian drone that had entered its airspace. 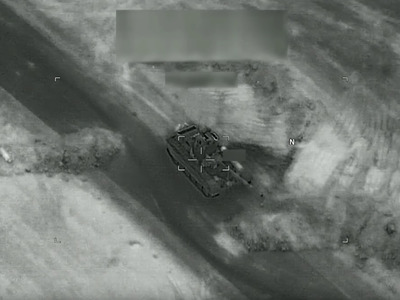 The Israelis retaliated by bombing Iranian and Syrian positions in Syria. Syria managed to shoot down an Israeli F-16 over Israeli airspace. The Israeli response was called off after Russian President Vladimir Putin called Prime Minister Benjamin Netanyahu and told him to de-escalate. 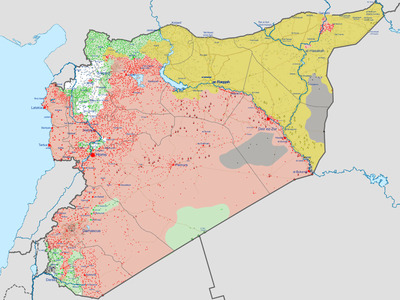 While not over, the Syrian Civil War in entering a new phase. ISIS is becoming less of a threat, Assad has, with the help of the Hezbollah, Iran, and the Russians, taken much rebel-held territory. The Kurdish SDF is now the second largest group in the region, but it is not clear if it will integrate with the Syrian government. Wikimedia commonsA map showing the status of the Syrian Civil War in March 2018. 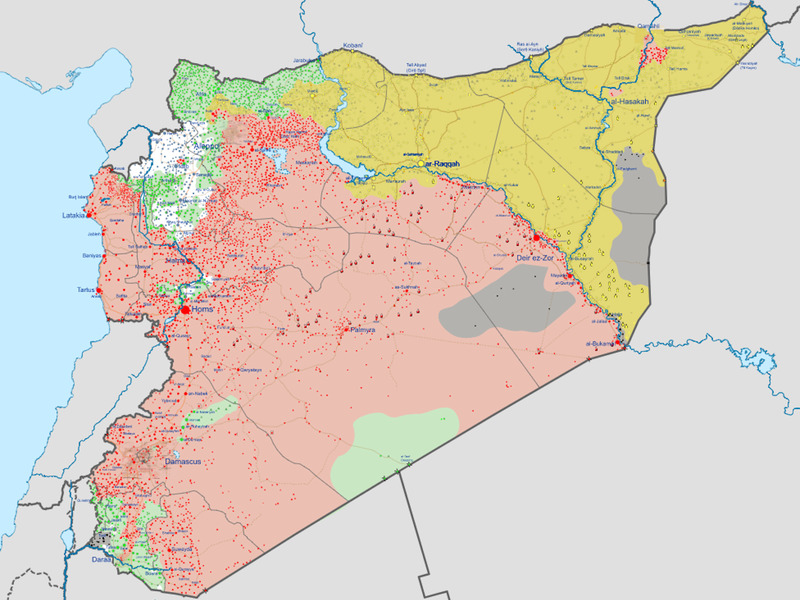 Red represents the Syrian government, yellow the SDF (Kurds), green the numerous rebel groups, black ISIS, and white Tahrir al-Sham. The Civil War has also spurred the biggest global refugee crisis since World War II. Nearly half of Syria’s pre-war population has been internally displaced or forced to flee their homes for other countries in the Middle East, Europe, and North America. On April 8, 2018, Syrian opposition activists and aid groups claimed that a chemical weapons attack on the city of Douma, a rebel held enclave near Damascus, killed dozens of people, including children. 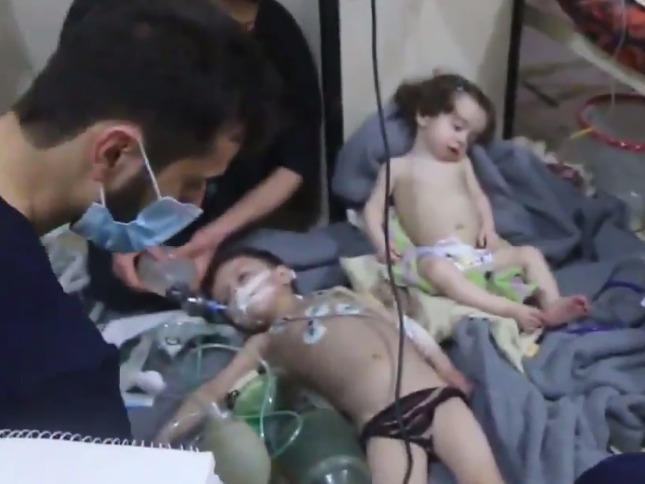 Screenshot/The White HelmetsTwo children are treated following a suspected chemical weapons attack in the Syrian city of Douma, just 6 miles away from the center of Damascus, April 8, 2018. The response to the attack was intense. Trump called Assad an “animal,” and warned that there would be a “big price to pay.” Israel, meanwhile, reportedly conducted an airstrike at the T4 air base in Homs province, the same base they had struck almost two months before. Two days later, on April 10, Russia vetoed a UNSC resolution that would have set up “a new investigative mechanism to look into chemical weapons attacks in Syria and determine who is responsible.” However, the Organisation for the Prohibition of Chemical Weapons said the Syrian and Russian governments invited the group to send a fact finding mission to the site of the attack.